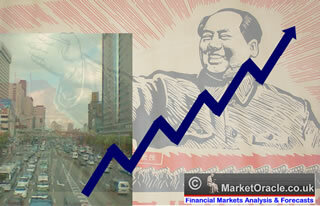 China 2012: The Year of the Bull (Rogers) or the Bear (Chanos)? What are China’s true growth figures? Rogers doesn’t trust any government’s numbers. He assumes they’re all lying. Yet China’s growth is faster than that of developed countries. A pullback in the West will affect China, but China will be hurt less. The CIA estimates 2010 exports at only 16% of China’s 10 trillion dollar GDP with growth of 10.3% (adjusting the fiat exchange rate for purchasing power parity). Rogers won’t live in any of his favorite cities in Mainland China, because pollution levels make them unsafe for his family’s health. Some estimates say that by U.S. standards, only 20% of Chinese cities have satisfactory air quality. But Chinese officials say 80% of the cities are satisfactory and improving versus last year. That’s hard to believe. The U.S. Embassy called Beijing’s pollution “crazy bad.” In December, 2011, cancer-causing fine particulate pollution caused a shutdown of the busiest airport in Asia, Beijing’s Capital Airport. Rogers sees money making opportunities for companies that can clean up and control pollution. Rogers acknowledged before Jim Chanos that there are localized real estate bubbles in China. In 2009, he warned about the urban, coastal real estate bubble. The government took action to quell speculation. Rogers believes China’s real estate problem is a price bubble more than a credit bubble due to lower leverage in the system. Chinese borrowers had to have good credit, make a substantial down payment on even a first home–many paid 100% in cash–and make an even larger down payment on a second home. Leverage through toxic securitizations never took off in China. Chinese real estate developers in some cities will collapse, but strong Chinese economic growth comes from various sources. In the U.S., many borrowers bought houses with no deposit and no job and sometimes more than one. Bankers leveraged bad loans many times over. The scale of the U.S. credit bubble was much bigger. The Chinese economy is much more than just real estate. Even as some of the real estate market collapses, other parts of China are doing well and will continue to do well. If Shanghai real estate speculators lose their shirts, other Chinese will profit in investments in solving China’s water problems, air pollution treatment, agriculture, raw materials, and energy. Rogers moved his family from New York to Singapore, where the government is committed to making Mandarin the city-state’s mother tongue within two generations. He’s committed to making it happen now for his daughters. In 2009, his daughters participated in a promotional video for Singapore’s “Speak Mandarin Campaign.” (Official languages include English, Malay, Mandarin and Tamil.) His older daughter, Happy, spoke fluent Mandarin as she instructed Baby Bee, her responsive then one-year old sister sitting on Paige Parker’s (Jim’s wife and the mother of his children) lap, to clap, clasp her hands in a Chinese New Year ritual, and then point to a light. Rogers’ latest book is A Gift to My Children. China will experience speed-bumps and pullbacks, but even in a slowing economy market share for specific items can continue to grow. China is experiencing what looks like explosive durable consumer demand, and there is both immediate and long term profit potential. McDonald’s started in China 15 years ago, and it took 10 years to breakeven. McDonald’s foreign franchise sales were up 7% in 2011. McDonald’s won’t release the numbers for China but says sales in China–its fastest global growth area–are up much more in 2011 versus 2010. McDonald’s is over the moon about finally catching on in China. McDonald’s announced it would increase from 1,300 franchises to 2,000 by 2013, its largest expansion so far in China. In 2011, McDonald’s was a top performing large cap stock partly due to the earnings boost from its franchises in China. According to Bloomberg, Yum! Brands, Inc. is thrilled with its KFC restaurant chains’ success in China. Its success swamps that of McDonalds. In 2011, revenues from China outstripped earnings from Yum’s various restaurant chains in the U.S. for the first time. Rogers’ bullishness is justified in his areas of focus. He has studied China’s issues with food production and consumption and its long term needs for raw materials based on global supply and demand for commodities. He favors all commodities over the rest of the decade, but especially suggests looking at the ones still depressed on a historic basis. The central banks of the world seem determined to print their way out of their problems and destroy the value of their currencies through inflation. That should boost the prices of real assets. Rogers is generally short global equities and owns real assets and producing agricultural land. James S. Chanos, President and founder of Kynikos Associates, L.P., made his reputation with a series of notable short calls spanning three decades including the bankruptcies of Baldwin United in the 1980s and Enron at the beginning of this century. The trenchant critic of fraud and hypocrisy is president of the board of trustees at the Browning School, a trustee of The Nightingale Bamford School, and a trustee of The New-York (sic) Historical Society.2 Chanos is a visiting lecturer of a well-received course at Yale: “Financial Fraud throughout History: A Forensic Approach.” Yet the cynical divorcee reportedly unwittingly gave his house keys to a prostitute he met in a nightclub and invited to parties–sloppy due diligence? Eliot Spitzer’s career as Governor of New York ended in March 2008, when he allegedly purchased the same prostitute’s sexual services at a Washington hotel. In the wake of the Spitzer scandal, Chanos said he was unaware of his house sitter’s illegal activities, and his own relationship was innocuous. Chanos frequents nightclubs in New York and Miami and is the “target” of multiple wayward Russians. He’s an inspiration for skeptics. The thing about corruption is that one can never trust where it ends. As “corruption” goes, gambling is legal in Macau. Money laundering, drug-trafficking, prostitution, and cooking the books are another story. Casinos are usually profitable because they enjoy the house odds. Yet I wonder if the books can be trusted to be any more accurate than Chinese reverse merger companies. (For an earlier discussion on swindles, corruption, and opaque government debt see: “Chanos Crash: Timing China’s Financial Meltdown,” TSF, December 6, 2010.) The shares of Macau casinos may get killed for reasons that make the trade ineffective as the long leg of his hedge…or not. When it comes to being long corruption, Chanos may have done his due diligence. A housing price crash causes distress even to unleveraged homeowners. To the individual homeowner and individual property developer, it matters very much. Many Chinese home buyers pay cash, but others make high down payments. Some first time home-buyers put down as little as 30%; high by U.S. “standards,” but still painful when housing prices drop 30%. Second homes require at least 50% down, and third homes (where allowed) require all cash. Some investors have bought multiple properties. Even if a borrower pays upfront in full, a housing price decline has a huge impact on how wealthy investors feel. Home prices in some areas of China are sliding fast. Some analysts say the “tippingpoint ” started in September and expect it to get much worse. Chinese newspapers reported riots in Shanghai after developers slashed prices to dump inventory. Contracted home buyers saw prices cut 25%. Some property developments in Beijing have had price cuts of 20-30 percent. China’s empty “ghost cities” are seeing price discounts of 30 percent for upfront cash payments. Mainstream U.S. financial media is now reporting possible housing price declines of 20-30 percent for major Chinese cities next year. Nothing creates a hard landing–at least locally–better than a housing collapse. Property construction accounts for more than 13% of China’s GDP up from around 3% of GDP in 1999 according to the China National Bureau of Statistics. Local Chinese governments have mounting debt to fund infrastructure projects of 10.7 trillion Yuan ($1.7 trillion) and depend on land sales to fund payments. According to investment management company GMO, debt in Local Government Funding Vehicles amounts to around 1/3 of China’s GDP. The projected slowdown in land sales will pose a huge problem, no matter whose numbers one uses. No one knows the size of local government debt obscured by off-balance sheet vehicles. Hidden national government debt includes “support” such as the stated support for the $330 billion and rising debt of the railroad. A variety of other guarantees have ballooned China’s real debt. On a scale of one to ten, Antos rates China’s debt problem an eight and Greece’s debt problem a ten. Chanos told me: “China should be thanking Greece,” for deflecting attention from China’s debts. Critics say the Yuan isn’t yet a freely convertible currency, but it’s made progress in that direction. China’s growth in areas unrelated to real estate, and the high household savings rate, and reserves suggest a very different economic outcome for China. GMO reports that Fitch estimates that 35% of bank loans are directly or indirectly tied to the Chinese property market, and UBS estimates it at 40-50% of outstanding loans. No matter which is correct, a pullback will be brutal. (“Between Errors of Optimism and Pessimism,” by Edward Chancellor, GMO, September 2011, and “China Real Estate–Final Destination,” UBS, August 25, 2011.) “Dubai times 1,000–or worse,” however, sounds like Chanos talking his book. Slowing property development in selected areas will mean less local revenue from land sales, and that will translate to more non-performing loans. Yet, even if the government eases, and property developers quickly recover; local citizens may be unwilling to sell arable land, because food prices are soaring. Odd things happen when people feel they’re not getting the straight story, and local government officials are stealing their land and money. In 2011, Wukan’s 20,000 citizens drove party officials out of town. Residents of the large fishing village balked when officials tried to illegally sell valuable land to property developers. Inflating food prices meant that people wanted the land to grow more food. Armed police were unable to retake Wukan. The provincial governor flew in and negotiated an agreement that included ousting corrupt local officials. The Wukan problem wasn’t one of policy or indifference to mass suffering; it was a rebellion against theft of public land by corrupt and greedy officials. This sort of theft has been happening in many areas of China. Now that food price inflation has made arable land more valuable, more citizens may wake up and fight corruption. Mainstream media spin centers around dealing with outraged townspeople instead of exposing and ousting corrupt officials. In that way, China’s politicians are like U.S. politicians, and mainstream media protects the politicians and their cronies. In other words, nothing has been settled, and it will be interesting to see if China becomes more unsettled in 2012. China has loaded itself up with debt, but it is a global creditor nation. High household savings is a buffer as is its relatively faster growth than developed nations. While being a fast-growing creditor country helps mitigate the consequences of folly, the consequences are catching up with China. Dylan Grice points out that anecdotal evidence can be misleading and China may “keep the plates spinning for a few more years.” (“Popular Delusions: On China’s swindles: how big is the bezzle?” by Dylan Grice, Societe Generale Cross Asset Research, November 4, 2011.) Localized real estate bubbles, dodgy lending, and outright fraud are specific problems, and supplier slowdowns and price declines are already in evidence. Do the previous anecdotes overstate the problem? That’s impossible to tell without reliable numbers. One also has to be skeptical of government growth statistics, yet many U.S. corporations have reported growth spurts that far surpass business in developed countries. The question is how quickly and to what degree will China’s problems affect its economy? It seems to me Jim Rogers and Jim Chanos are each answering this question in his own way. Jim Rogers invests in durable demand growth for selected commodities–especially the supply constrained ones that are still depressed on a historic basis. He’s bullish on water and air pollution treatment, agriculture, raw materials, and energy. Jim Chanos is shorting specific banks, property developers, and suppliers of construction materials such as iron ore, cement, steel and coal. It looks as if 2012 isn’t the year of the bull or the bear. It’s the year of the Jims. 1 Jim Rogers and I have been professional admirers for several years, and his blurbs appear on the dust jackets of two of my books: Structured Finance, and Dear Mr. Buffett. To read the original pdf by Janet Tavakoli with links click here. Janet Tavakoli is the president of Tavakoli Structured Finance, a Chicago-based firm that provides consulting to financial institutions and institutional investors. Ms. Tavakoli has more than 20 years of experience in senior investment banking positions, trading, structuring and marketing structured financial products. She is a former adjunct associate professor of derivatives at the University of Chicago's Graduate School of Business. Author of: Credit Derivatives & Synthetic Structures (1998, 2001), Collateralized Debt Obligations & Structured Finance (2003), Structured Finance & Collateralized Debt Obligations (John Wiley & Sons, September 2008). Tavakoli’s book on the causes of the global financial meltdown and how to fix it is: Dear Mr. Buffett: What an Investor Learns 1,269 Miles from Wall Street (Wiley, 2009). © 2012 Copyright Janet Tavakoli- All Rights Reserved Disclaimer: The above is a matter of opinion provided for general information purposes only and is not intended as investment advice. Information and analysis above are derived from sources and utilising methods believed to be reliable, but we cannot accept responsibility for any losses you may incur as a result of this analysis. Individuals should consult with their personal financial advisors.